Nutri-Fly® Bloomington Formulation is made to accommodate the requirements of large, communal Drosophila media preparation facilities as well as small, independent laboratories. Recipe can be doubled, tripled, etc. in the same batches to meet any media quantity requirements. For consistency, most ingredients* come from the manufacturers cited on the Indiana University, Bloomington Drosophila Stock Center website here. Sealed in single-use foil pouches, Nutri-Fly® BF is not only convenient but also robust, and guaranteed to make fresh and substantive food throughout its shelf-life of two years from delivery. Strict lot traceability procedures are employed to each ingredient, in every batch. Ingredients Include: Quaker Yellow Cornmeal, Agar Type II, Tate and Lyle Corn Syrup Solids, Lynside Nutri Inactive Nutritional Yeast, ADM Soy Flour. Directions: Empty entire contents of packet into a cooking vessel. Add ¼ – ½ specified RT H2O and stir out any clumps. Add remaining RT H2O and stir. Bring to a boil, then immediately reduce heat and cover. Simmer for 10 minutes, stirring occasionally. 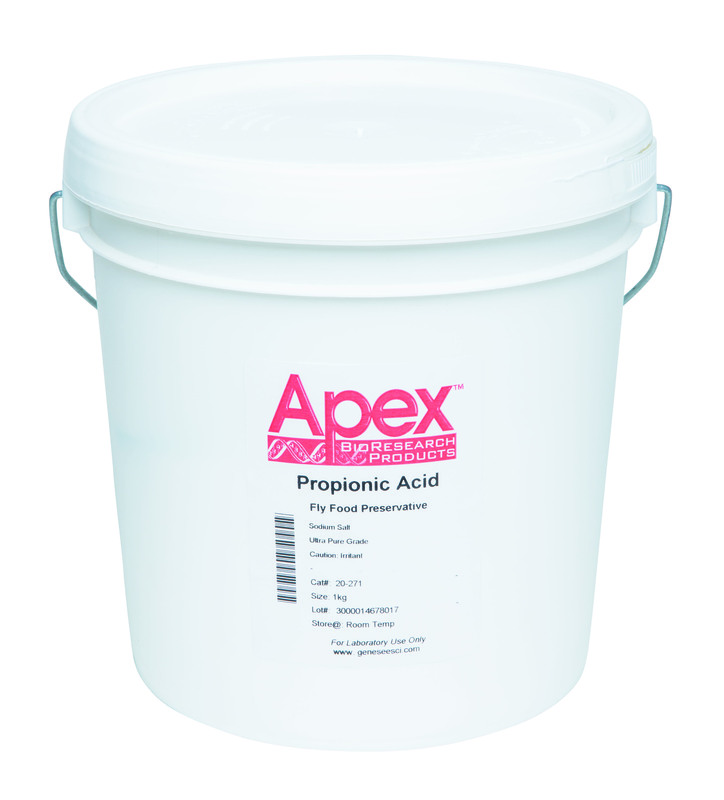 Add specified propionic acid (1.0m)** quantity, (not supplied). * Corn syrup solids have been substituted in place of light corn syrup. ** Tegosept (Cat # 20-258, 20-259, 20-266 / synonyms: methyl paraben; nipagen) may be used in addition to but not instead of propionic acid. 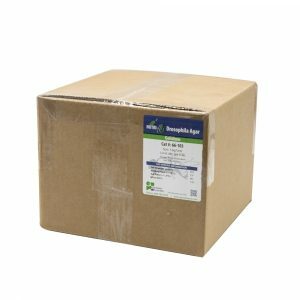 Propionic acid is considered sufficient as a preservative and the use of tegosept is known to slow Drosophila growth rates in the larval and pupal growth stages and we therefore suggest it be used only when additional fungal protection is necessary, or to eliminate sporadic mold problems. 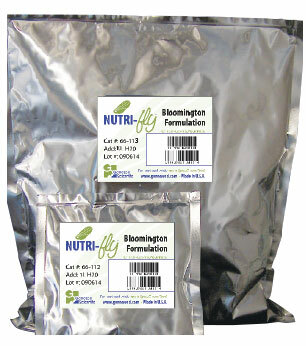 Click Here to request a sample of any Nutri-Fly Formulation. This prepackaged media is rich in nutrients and is ideal for weak Drosophila strains. Flies have been shown to be at least ten times more productive when compared with cornmeal-molasses-yeast food. The convenient single use 1L air tight packets ensure every batch is fresh. This recipe is based on the Indiana University, Bloomington Stock Center Semi-Defined Medium recipe here. Directions: Empty entire contents of packet into a cooking vessel. Add ¼ – ½ specified RT H2O and stir out any clumps. Add remaining RT H2O. Bring mixture to a boil and turn off the heat source. Cool to 60°C and add specified propionic acid** quantity (not supplied). This new Drosophila food recipe is for labs requiring molasses based media and is perfect for use in large communal media preparation facilities and small independent laboratories. The robust, air-tight packets ensure that each batch is fresh and consistent over the two year shelf life. Strict lot traceability procedures are employed to each ingredient in every batch. This recipe is based on the Indiana University, Bloomington Stock Center Cornmeal, Molasses and Yeast Medium recipe here. Directions: Empty entire contents of packet into a cooking vessel. Add ¼ – ½ specified RT H2O and stir out any clumps. Add remaining RT H2O and stir. Bring to a boil, then immediately reduce heat and cover. Simmer for 10 minutes, stirring occasionally. Add specified propionic acid** quantity (not supplied). Easily setup new cultures in minutes with the easy-to-use Nutri-Fly® Instant. Each 1L packet of Nutri-Fly® Instant will prepare ~80 vials. Nutri-Fly® now comes in Superbulk! This airtight pail is guaranteed to keep food fresh for up to two years when sealed properly. Scaling your recipe to meet your needs has never been easier. Strict lot traceability procedures are employed to each ingredient in every batch, ensuring consistency and quality. Add 200ml powder/1 L H2O. The Droso-Filler is now available to fill trays of 100 narrow diameter vials, 100 wide diameter vials and trays of 25 square bottom bottles! Simply fill the trough with your flies’ favorite food and pour, pour, pour tray after tray fast, fast, fast! Made from food-grade stainless steel with a Teflon sliding plate. Available exclusively from Genesee Scientific. Includes a 5-year warranty with a 90-day full refund return policy. Upgrade your old Droso-Filler with the new post o-rings. Adjustable back stop for use with nearly all trays. The introduction of the Droso-Filler MAXX accessory has completely automated the tray filling process. In conjunction with an air compressor (bundled with purchase), this new accessory for your Droso-Filler uses a pneumatic mechanism to effortlessly slide the Teflon plate, previously operated with a handle. Now your Droso-Filler can be operator by a single finger, meaning MAXXimum efficiency when filling any tray. Droso-Filler is a trademark of FlyTabs Inc.
Grape Agar powder premix offers convenience and consistency. The crucial ingredient is Concord grape and ours comes from a unique vacuum freeze-drying process which captures the robust flavor, aroma, color and nutrients of the best quality, fresh, mature Concord grapes. The highest purity food grade agar is used in the ideal ratio to other ingredients to produce a truly perfect juice agar plate. Our Quality Control does not stop with the best ingredients – we rigorously test multiple batches from every lot to assure the product used in your lab makes the best plate, every time. Grape vs. Apple? Take the Genesee challenge! We unconditionally guarantee you will get the most egg beds that can possibly be laid when you pour Flystuff grape agar plates. Click Here for Grape Agar instructions. Each single-use packet of Nutri-Fly® Grape Agar Powder Premix makes 500ml. Our technical grade Drosophila agar (USP) is a staple ingredient in fly food. 100 mesh particle size. Lot-to-lot quality control processes assure consistency in your fly food. For example, if the recipe calls for 10g of agar and the gel strength of the agar used in the previous batch was 850g/cm2 and the agar that will be used in the new batch has a gel strength of 900g/cm2, you will need to adjust your recipe and add 10 x 850/900 = 9.44. So, to keep your food consistent, you would add only 9.44g of agar instead of the 10g of agar that the recipe calls for. Apex brand Tegosept is widely used as a fly food preservative. 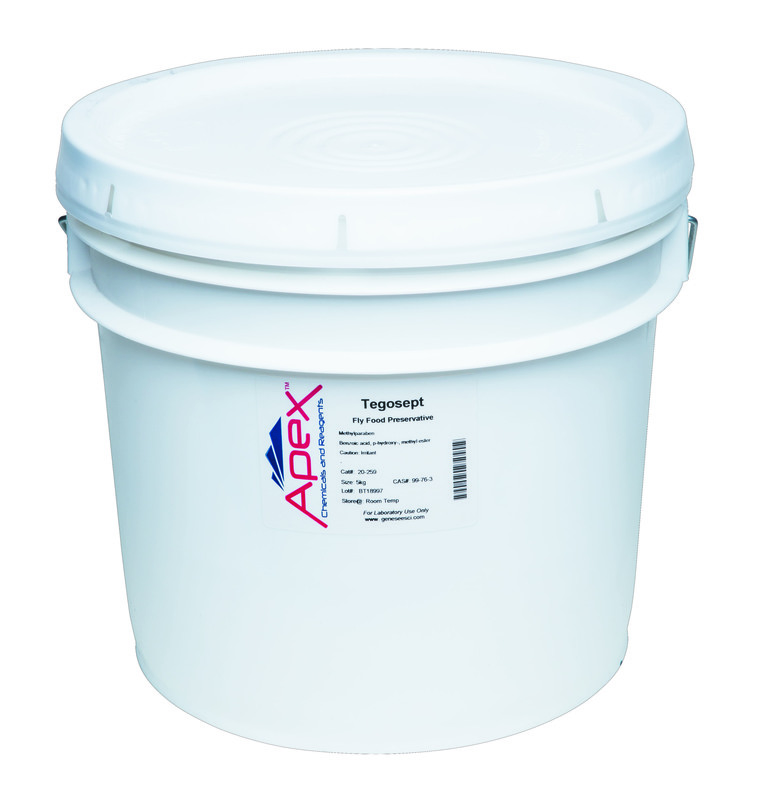 Odorless, tasteless and non-toxic (sanctioned for food use), Apex Tegosept is active at low concentrations against a broad spectrum of micro organisms. Tegosept may be used in addition to but not instead of propionic acid. Propionic acid is considered sufficient as a preservative and the use of tegosept is known to slow Drosophila growth rates in the larval and pupal stages and we therefore suggest it be used only when additional fungal protection is necessary. Click here for a certificate of analysis. Synonyms: Benzoic acid, p-hydroxy-, methyl ester; methyl paraben; nipagen; Lexgard M.
Our enriched, degerminated yellow corn meal has been tested and approved by several reputable Drosophila laboratories. Lot-to-lot quality control processes assure consistency in your fly food. Propionic Acid, Sodium Salt is a safe, simple and economical alternative to Propionic Acid as a fly food preservative. This odorless white powder is easily water soluble and is not considered a hazardous material. No loss of performance has been reported by the kitchens who have changed to the salt form of Propionic Acid, making Propionic Acid, Sodium Salt the best overall decision in food production. Click here to view the Propionic Acid, Sodium Salt Preparation from Protocol. A primary grown inactive dried yeast product. The yeast is grown under carefully controlled conditions and then dries on drum dryers. It is a natural source of B vitamins, minerals, and amino acids. Readily dissolves into any fly food recipe. 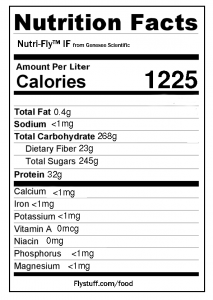 Ingredients are pure Saccharomyces cerevisiae. This Red Star Active Dry Yeast (ADY) is a free flowing dry granular product. Packaged in a vacuum sealed foil laminate pouch for convenience and to preserve freshness at room temperature. Corn syrup solid is an ideal substitute for liquid corn syrup. Compare to Karo used in Indiana University, Bloomington Drospohila Stock Center medium. Substitute 700g corn syrup solid for 0.75L of liquid corn syrup. With this Automated Fly Food Dispenser, you can bypass bottlenecks associated with manually filling vials in your Drosophila media production process, and begin producing a higher quality product at a much faster pace. 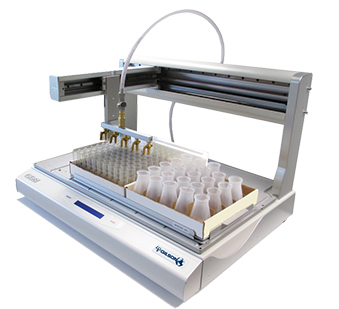 A user loads the Drosophila vials of choice onto the system (additional vial/bottle configurations available upon request), and the software automatically positions a multi-channel dispensing head just over the top of the vial. Fly food is delivered by pump to quickly and efficiently fill the entire tray. Available from Genesee Scientific in the United States only. For availability in other countries click here. www.flystuff.com - Some people might think we do a good job at making fly products.